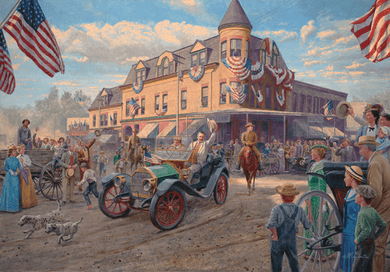 Mort Kunstler Handsigned & Numbered Limited Edition Print:"Teddy's Fourth of July"
Size: Image Size: 18" x 26" / Overall Size: 23" x 30" - Canvas Size: 23" x 33"
About the Print: Americans called him "Teddy" or "T.R.," and even in his day he seemed larger than life. He was an author, a cowboy, a politician, a historian, a war hero - and the 26th President of the United States. Determined, exuberant, strong-willed and patriotic, Theodore Roosevelt was like no other American president. Born in New York City in 1858, he was a sickly child who spent his time in studies. He was graduated from Harvard University, and left the study of law at Columbia University to serve as a New York legislator - until exiling himself in the "Wild West" following the deaths of his beloved first wife, and his mother. In 1886, he emerged from two years of cattle ranching in North Dakota as a robust, energetic and determined leader. Although defeated as a candidate for mayor of New York City, he earned respect as a Federal civil service commissioner, served as head of the New York Police Commission, and somehow found time to write an acclaimed history of American westward expansion called The Winning of the West. As its Assistant Secretary, he strengthened the U.S. Navy at a pivotal time in history; and during the Spanish-American War, he led the cavalry regiment he had organized - the "Rough Riders" - in a bold charge up Cuba's San Juan Hill to become a national hero. Back home he was elected governor of New York, then was made the vice presidential running mate to Republican William McKinley, who was elected president in 1900. Less than a year later, McKinley was assassinated, and Theodore Roosevelt found himself the new President of the United States. Pronouncing the job a "bully pulpit," he pursued his duties with his typical drive and enthusiasm. He attacked illegal business practices, projected American naval power around the globe, helped establish America's national parklands and modern conservationism, launched construction of the Panama Canal, and won the Nobel Prize for bringing an end to the Russo-Japanese War. Always, he was the enthusiastic family man, the dynamic leader and the supreme patriot - who loved his little hometown of Oyster Bay, New York and his large, rambling home at Sagamore Hill. Throughout his presidency he attempted to celebrate every Independence Day in his hometown. Each visit was a personal and patriotic event, marked by flags, parades, speeches and exuberant celebration. Oyster Bay and its proud, patriotic people typified the best of the American nation to Roosevelt, especially on Independence Day. For "Teddy," the Fourth of July was a "bully" event - and it was always a privilege to be an American. What an extraordinary person was Theodore Roosevelt! And how special it is for me to paint him in our hometown of Oyster Bay, New York. Living in Oyster Bay means living in the shadow of the exceptional "T.R.," whose famous Sagamore Hill home is a National Historic Site. In all of the thousands of paintings I've done, only two have featured Theodore Roosevelt - until now. Teddy's Fourth of July is my third, and the only one set in Oyster Bay. So this has been a rare and remarkable treat for me. For many years, my friend and Oyster Bay neighbor, Roger Bahnik, encouraged me to do a painting of Theodore Roosevelt in Oyster Bay. I just always had too many other projects underway, especially Civil War paintings. Finally, Roger told me, "Roosevelt is our Oyster Bay President; you are Oyster Bay's artist -- I want to commission you to do this painting." And I finally said, "He's right. And I'm putting aside everything else until I do this painting." Now it's done, and I'm so glad I painted it. Frankly, I figured it would be a commissioned original only - the people who buy my art expect Civil War subjects - but by sheer coincidence, it turned out that 2008 is the 150th Anniversary of Roosevelt's birth and the 100th anniversary of his presidency. By the time I was halfway through the painting, I had received numerous requests for prints of it. So Teddy's Fourth of July is being issued as a limited edition fine art print. I think it's a wonderful slice of Americana. I've thoroughly enjoyed working in this era of American history. It was a wonderful period of hope and enthusiasm, and a very colorful time of transition from horse and buggy to the early motor car. Oyster Bay proved to be the perfect model for small-town America in the early 20th Century. Visit Oyster Bay today on your way to Sagamore Hill National Historic Site and you'll recognize the building featured in the painting, just as Civil War buffs recognize so many period structures in my Civil War artworks. It's what's known in Oyster Bay as "the old Moore building." It was the local office for President Roosevelt's staff during the days of the "Summer White House," and it still stands today on the corner of South and East Main Streets. Its corner turret, curved window sashes and curved glass are so reminiscent of turn-of-the-century American design. Of course, the center of interest had to be "Teddy" Roosevelt. Oyster Bay historian John Hammond was of enormous help in the research for this painting. Thanks to John, and to Theodore Roosevelt Association Director Jim Bruns, I was able to pore over countless period photographs of President Roosevelt, automobiles of the era and the appearance of Oyster Bay a century ago. T.R. re-enactor Jim Foote also helped with research, and posed for me in Roosevelt's typical Panama hat and white linen suit. I learned that Roosevelt loved to come home to Oyster Bay, and tried to celebrate the Fourth of July in Oyster Bay every year from 1902 to 1910. He loved America and he loved Oyster Bay. His grave is in Oyster Bay and the National Park Service has done a superb job of preserving his home at Sagamore Hill. To me, Teddy's Fourth of July is a snapshot of America at her best. I hope this painting captures the enthusiastic spirit of "Teddy" Roosevelt - and the nation and the little town that he loved so much.